A mother's grief turns into a place of peace for children. The Michael J. Prescott Peace Center is now open and holding a basketball camp for children in the community. Prescott died in November 2015 after he was shot by someone he knew. 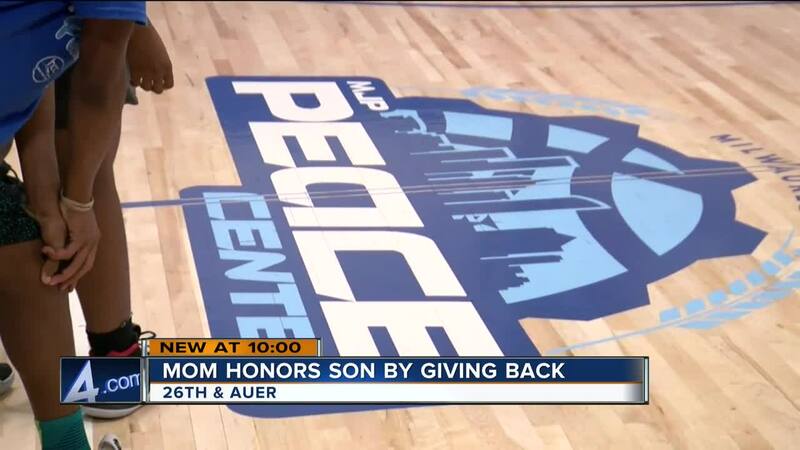 After his death, his mother decided to open a peace center in his memory. It's now up and running at 2602 W. Auer Ave. and this week, hundreds of kids attended basketball camp there with a special coach, former NBA player Rodney Buford. "At one point, I looked at a child and said 'wow,' you know I remembered when Michael was playing basketball, this was all that he loved to do," said Michael Prescott's mother, Rosslind Prescott McClinton. The man who killed her son is now serving a life sentence for the crime . But she can now see her son's dream become a reality. "He wanted his own gymnasium, this is his dream come true," said Prescott McClinton. "It bears his name, the 'Michael Jerome Prescott' Peace Center." Volunteers from a local church helped renovate the space last year. Prescott McClinton says the center is bringing peace to a neighborhood plagued by violence. The grand opening of the center was even interrupted by a shooting nearby. "It's all been positive, everyone has had a great time," said Prescott McClinton. Children receive three meals a day, camp during the summer and once school starts again, a place to go for homework help. "You bring them together with basketball and then you start branching off into other areas of life," said Deon Williams, a basketball coach at the center. "Once they start listening to you in the gym, they'll start listening to you off the court."